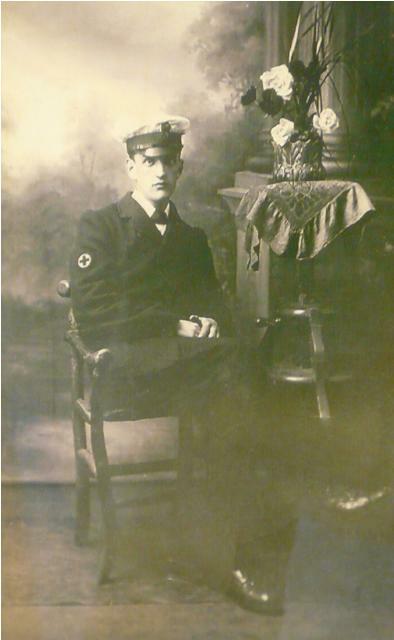 The following letter was sent by Fred Reddiough on the 21st Oct 1914, and was donated to the Whitby Lifeboat Museum by his niece Mrs Pamela Selmes of Barnoldswick. The letter is reproduced with here without any changes to the punctuation and spelling. 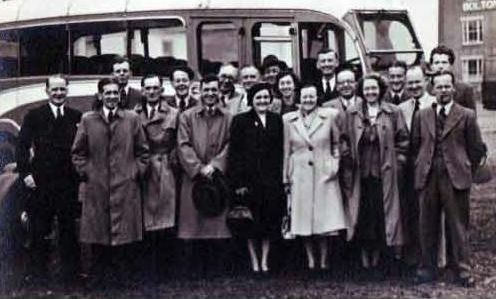 Fred is pictured right on a trip out of Barnoldswick, although which of the gentlemen he is remains unknown. I suppose you will have heard the news by now but not quite all. Well I will tell we were sailing down the east coast bound for Dunkirk in France. Well on Thurs night it was one of the roughest nights we had had since we have been away the wind was blowing the ship wherever it wanted. We could’nt get to sleep all night. Well about 4 oclock the following morning the ship shook stem to stern. We all nipped out of bed and the water was pouring down the hatches in torrents. When I got out of bed I was ankle deep in water so I nipped into my pants and grabbed my lifebelt and ran. Well when I got to the end of the line of bunks some bottles came dashing past and cut one of my toes clean off all bar a bit of skin and I was walking about like that for about 4 hours so you can just think what I went through. Well when I nipped up the stairs into the saloon passage it was full of water and I was sent up against the wall. Well I then went up some more steps onto the promenade deck and then onto the boat deck no sooner had I got onto the boat deck than I was swept off my feet about three times the waves coming mountains high then I got hold of a ventilator along with some chaps when a wave came and swept us all off our feet right up against the rails. There I was in about three feet of water trying to get my wind. Well I got got up behind a boat out of the way of the waves when I saw Tony just behind me. Well I went forward and got into the Marconi chaps cabin and staid there till daylight. Then the ships doctor came and said we had better get out of there as it was,nt safe. Well we spied our chance (I was with Willy Anderson there I had lost sight Tony) we waited till a big wave had gone by then nipped forward into another cabin then I lost sight of Anderson. So I was on my own as far as our chaps was concerned. Well I stopped in there for about another hour and a half and there was a lifeboat coming along side and the Captain shouted women first as you know we had four sisters and a stewardess on board. Well these got in and some more chaps. So I said to myself when the boat comes back I am for it so I got onto the rail and waited for it to come back and when it did come back I got hold of a rope and slide down it into the lifeboat a man pulled me in by the feet. Well when I looked up I saw Tony stood by the rail so I sent the rope back and Tony got hold of it and he came down into the boat and I think that we are the only two from Barlick that got safed. I am now at the Cottage hosp Whitby. I have just had my father and Fred Smith (from Leeds) here. Well I am lucky to be here I can tell you I could not go through it again not for a fortune. Well dear you can write to me here if you like I think I shall be here for a while yet and then I shall get home leave for a while. So it wont be long before I see you again. Although I am still unable to positively identify which one is Fred in the photograph, I am very pleased to be able to add another photograph to this page. The photograph to the right is one captured during a portrait sitting. I have other similar postcard photographs some with the Forth rail bridge as a screen backdrop, leaving me to believe they were taken sometime before the ship left Leith on its fateful last voyage.